The only generator with cold start preheater and wireless remote. We include a spare set free of charge. A popular option now available on all our generators. Air Fuel mixture is preheated to help it vaporize in the engine during cold starts. User can turn it on or off as needed. Long Range Key-chain Remote Control Starter. Stay in the comfort and security of your home. Long Range RF Remote lets you start and stop your backup generator without ever having to go near it. Similar to a cars odometer that tells you when its time to change the oil or how long its been used, the included hour meter on this generator shows you how long it's been running. No more guess work. This engine will NEVER bog down under load. No Brownouts, Clean non-interrupted power. From Fuel Filters to Fuel Pumps and gaskets, we carry spare parts for our prodcuts. All our products are EPA approved. Smaller engines have to work harder because they have less power. Smaller engines will often bog down when peak power is required. Unstable power, Electrical Failure, and brownouts are common with lower HP engines. We use the most powerful engine on the market. When you demand power on units with smaller engines they bog down. Because we use a 13 HP engine you get a true 6500 Watts without any power fluctuations. Cars need an odometer so you can tell when its time to change the oil, how old it is or when it should get service. A generator should have an HOUR METER. This model runs 12 hours on the same amount of fuel others only run 8 hours. That is 12 hours at full load. Don't get fooled, eventually you will need a part, an air filter or oil filter. A generator is like a car and you need the company to be around long after the sale. From fuel filters to fuel pumps we carry a wide selection of replacement parts. There are many cheap units on the market without a cold start preheater. This unit includes one. Preheater helps fuel vaporize by warming the air fuel mixture for easier starting. 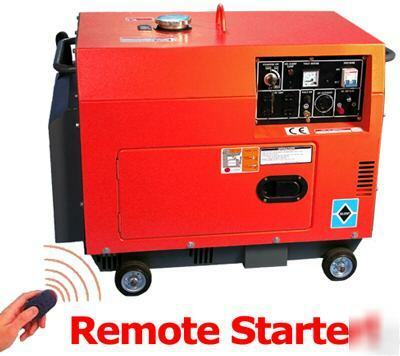 Start the generator by a RF Remote Control from the comfort and safety of your home. 12 Hours on full load per tank. Electric Starter with Battery and Wireless Remote Control. * We pay all the taxes. You never pay anything more. * For warehouse pickup near you call us at 1-866-Hydro-86 to make an appointment. * Color of units may vary, we have Red, Blue and Orange/Yellow. * Electronic invoice will be created by us, Aurora Generators Inc. and sent to you as a PDF file attachment. Print it out, take to your bank and pay at any teller, its easy. * We also accept Money Order, Bank Draft or personal checks. * Contact must be made within 24 hours of delivery. * Item must be in original condition. * RF Remote transmitter and receiver are not covered by warranty. Local signal interference, low batteries or limited range caused by environmental conditions my adversely affect its operation. just like a car, over time things can break down. We sell an extended mechanical breakdown warranty. warranty for an additional year.